What Are The Rules to Crazy Pineapple Poker? - Casino Answers! Casino Answers » Poker » Crazy Pineapple » What Are The Rules to Crazy Pineapple Poker? What Are The Rules to Crazy Pineapple Poker? Crazy Pineapple Poker is a game very similar to Texas Hold’Em. The betting structures are the same, as well as the positions, order of who is to act etc. For all the general rules, make sure to read the Texas Hold’Em Rules section. There are two differences in Crazy Pineapple that make it different from Hold’Em. They are that instead of two hole cards, you are dealt three hole cards, and then must discard one of the cards after the flop. So for example if you are dealt :qd: :jd: :qs: and the flop is: :qh: :qc: :2h: you’d be discarding the :jd:, while on a flop of :ad: :10d: :kc: you would be discarding the :qs:. Because of this quirk in the game, a pocket pair is great, but a pocket set would be terrible as you would have to fold one of them and you would have really poor odds of hitting another set with only one out. :ac: :2c: :3c: :4c: :5c: which is the nut low and has a very, very, very strong chance of being the nut high, will give you the chance to win both the low and the high, and be able to yell SCOOP DOGGY DOG! One thing to keep in mind when playing Crazy Pineapple Poker is to beware of flushes. When a player has three hole cards instead of two and the flop hits three of a suit, you can be almost positive that one of your opponents has made the flush. The odds are not in your favor in that case and you should make sure that you have a hand that can beat it before you get too far into the pot. While the game has unique rules compared to other poker games, things like pot odds, bluffing, drawing hands and implied odds still apply in this game. 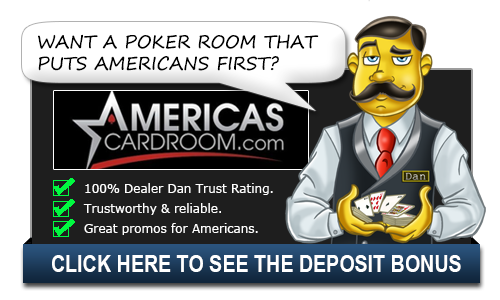 There are strategic differences in this game to be sure, but the basic tenants of quality poker play still apply. Online Availability: Crazy Pineapple Hi/Lo and regular Hi is available at both Ultimate Bet and Paradise Poker. Where can USA players play Crazy Pineapple Poker? If you are located in the United States of America, you can play Crazy Pineapple at Ultimate Bet. Where can I learn more about the Crazy Pineapple game rules? For more on Crazy Pineapple Poker, you will want to have a look at the Texas Hold’em Rules for the basic overview.